December, 2008 | You Think What? Damon Weaver is a student reporter at the Katherine E. Cunningham Elementary School in Canal Point, Palm Beach County, Florida. The new private jet charter airline Million Airways announces “hassle-free flying” for your flight travel convenience. General Motors Acceptance Corporation, GMAC, is now a bank. We believe someone at the New York Times made a grave error when they selected Nicholas Confessore, (NC) and David Halbfinger, (DH) to interview Caroline Kennedy,the daughter of the late president, about her interest in being appointed to the soon to be vacant senatorial seat for the great state of New York. There’s news about Paris Hilton, our favorite hotel heiress and actor Leonardo DiCaprio. Get the details here. Read the details of the life of Eartha Kitt who passed away on Thursday, December 25, 2008. 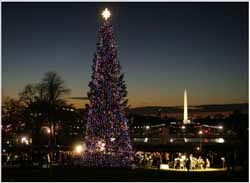 At this time of year there is much talk about a star. We turn our eyes toward the heavens. Here is Robert Frost’s poem about a star. We recently found this item on the Internet(s) while doing our Christmas shopping. The folks at the R+M Design agency say this review is the same one Santa Claus uses to determine what gifts to give good or bad boys and girls of all ages. See what your Christmas will look like when you click on the NAUGHTY or the NICE buttons. Click on the Christmas tree or on the presents under the tree. Have a Merry 2.0 Christmas! Congratulations to Alek Komarnitsky the winner of the 2008 Kentucky Fried Chicken Original Holiday Traditions contest – screenshot. 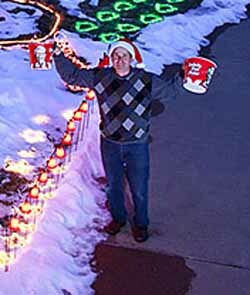 Kentucky Fried Chicken ran a nationwide Holiday Traditions Contest and Colonel Sanders has selected the Controllable Christmas Lights for Celiac Disease as the winner. Created by miloIIIIVII | WordPress | Entries (RSS) | Comments (RSS) | 34 queries. 0.233 seconds.